Wonderful house sitting on a nice, flat double lot on a dead-end street. New carpet in the spacious living room. New metal roof on the main house. New side door. First floor offers a bedroom with a sitting room, family room, full bath and separate entrance that make a great space for guest or extended family or if you are in need of a first floor bedroom and bathroom. Or use the family room for the kids, while the adults hang out in the other living room! Nice kitchen with separate dining area. Enclosed porch make a great space for an office. 3 bedrooms and a full bath upstairs. Great outdoor space for entertaining and relaxing with the covered patio area and large yard. Small barn at the back of property. 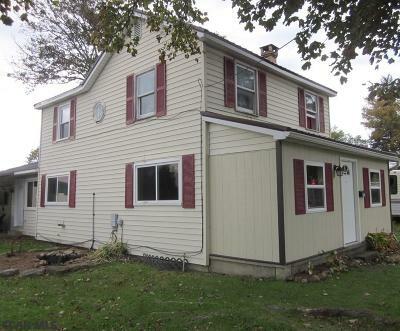 This home/property has a lot to offer at this low price of $100, 000! Directions: 322 To Philipsburg. Follow 322 To The Light. Stay Straight Onto Railroad Street. Turn Right Onto N.